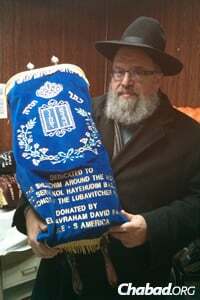 While in New York City at the beginning of the year, Rabbi Levy Wineberg made a purposeful stop to pick up a very important item: a brand-new Sefer Torah. He walked across the street from 770 Eastern Parkway—headquarters of the Chabad-Lubavitch movement in the Crown Heights neighborhood of Brooklyn, N.Y.—to the office of a sofer (scribe), where the Torah was wrapped and packed up carefully for travel. The rabbi—dean of the Hama’or Centre in Johannesburg—carried it with him on the plane, complete with a letter for customs officials explaining the unusual bundle, which will remain in South Africa for some time. It is one of seven newly written Sefer Torahs being sent to six different continents: Africa, Asia, Australia, Europe, North America and South America. They were commissioned by a single person, Chilean businessman and philanthropist Leonardo Farkas, whose parents, Jews of Hungarian descent, emigrated from Transylvania to South America in 1939. The recipients—Rabbi Wineberg of South Africa; Rabbi Mordechai Abergel of Bali; Rabbi Eliezer Lyons of New Zealand; Rabbi Yehoshua Kaminetzky of Serbia; and Rabbi Yossi Freedman of Ohio—were chosen in December as part of a Torah loan lottery that prompted 180 Chabad emissaries to send in applications for consideration. In addition, Farkas donated another two new Torahs directly to Chabad centers run by Rabbi Benjy Korf in Miami, Fla.; and Rabbi Menashe Perman in Santiago, Chile. The Torahs are being distributed by Merkos L’Inyonei Chinuch Suite 302’s Beis Yisroel Free Loan Torah Society in Brooklyn. “There’s a huge need in the shlichus world, and especially amongst new shluchim, for Sifrei Torah, and we are very happy to be sending Torahs to six parts of the world—to spread Torah all over,” says Rabbi Mendy Kotlarsky, executive director of Merkos Suite 302. Farkas has a strong passion for dedicating “happy Torahs,” as he refers to them, which will be used in places with a strong need. 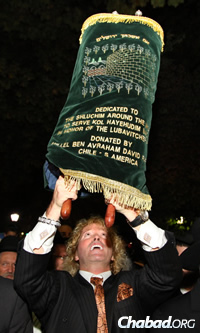 Over the years, he has donated many Sifrei Torah to Chabad and other institutions all over the world. To celebrate these new ones, he came to New York for a jubilant ceremony—attended by thousands—last fall at Yeshivat Chovevei Torah Rabbinical School in Brooklyn. Popular music entertainer Avraham Fried performed, and some 500 children took part in a program specifically geared for them. When the Torahs were first completed, there was a celebratory procession down Eastern Parkway in Crown Heights with dancing and singing, followed by a Seudat Mitzvah (festive meal) at the Jewish Children’s Museum in Crown Heights. The lottery winners were announced on the fifth day of the Hebrew month of Tevet, a significant day in the history of the Chabad-Lubavitch movement. Tevet 5 is celebrated as a day of rejoicing in the community. On this date in 1987, U.S. Federal Court issued a decision in favor of Agudas Chassidei Chabad (“Union of Chabad Chassidim”) regarding the ownership of the priceless library of the sixth Lubavitcher Rebbe, Rabbi Yosef Yitzchak Schneersohn. The ruling was based on the idea that a Rebbe is not a private individual, but a communal figure synonymous with the body of Chassidim. 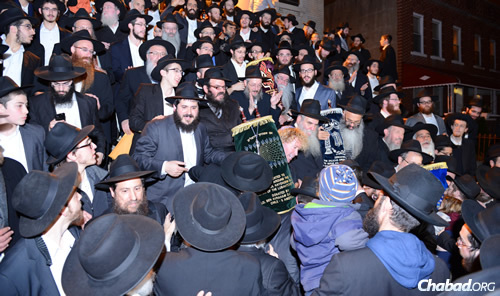 The Rebbe—Rabbi Menachem M. Schneerson, of righteous memory—Rabbi Yosef Yitzchak’s son-in-law and successor, urged that the occasion be marked with time devoted to the study and acquisition of Torah books. Rabbi Yossi and Chaya Freedman, co-directors of Chabad of Downtown Cleveland, with their daughter Nechama. The couple won one of the new Torahs donated by the Farkas family as part of a recent lottery. The couple, who started their Chabad House in August, is just getting going with programs and, once the Torah arrives, minyans on Shabbat and during the week. They will serve a Jewish population of between 10,000 and 15,000 people, many of whom commute to jobs in the city from their homes in the outlying suburbs. A sizable percentage of them, according to the rabbi, are observant. “There wasn’t an Orthodox establishment in downtown Cleveland in the last four decades. There was a void to be filled,” he says. “We have an existing clientele, and we’re looking forward to offering them a local Jewish outlet. Rabbi Eliezer and Chaiky Lyons from Kfar Chabad, Israel, arrived in New Zealand shortly before Passover last year to run Chabad of New Zealand, based in Auckland. Chabad Lubavitch Serbia was founded in 2008 by Rabbi Yehoshua and Miri Kaminetzky. Located in the capital Belgrade, it serves all of the scattered Jewish communities in Serbia. The rabbi estimates that 3,200 Jewish people live in Serbia, and according to other figures, at least another 2,000 are there, though not affiliated with the community. “We are in contact with 400 Jews who come to celebrate the holidays with us, and we are their Jewish home,” he writes via email. “I was very excited to hear I had been given a Torah scroll. It’s a special day for me and for our entire community. Until now, we did not have our own Torah. For the holidays,” he explains, “we borrowed a scroll from Chabad-Lubavitch in Hungary or Romania. But it was always for short periods of time, and it was difficult and complicated to bring it here and then return it. Serbia’s Chabad runs an educational center for children of all ages during the week, teaching Hebrew and Judaism. Adults can partake of classes on Jewish law, Talmud, Jewish history and the weekly Torah portions. Weekly Shabbat minyans are followed by a Kiddish meal, which Kaminetzky notes are well-known for their genial atmosphere and singing. That flavor will be enhanced with the most important ingredient of all: a Torah of their own.